Before we get to all Friday Favorites listed below, let me remind you that this past Sunday, in Pasadena, I attended one of my FAVORITE events all year, MASTERS OF TASTE. I pinned a great little Insta-story about it to my Hollywood Brunch feed you should go check out. Chris Evans wants to sing on Broadway and I am here for it. Uh….. Patti LaBelle is launching her own line of… FROZEN CHINESE FOOD? This Indiana school district turns unused cafeteria food into take-home meals for kids who need. So wonderful. 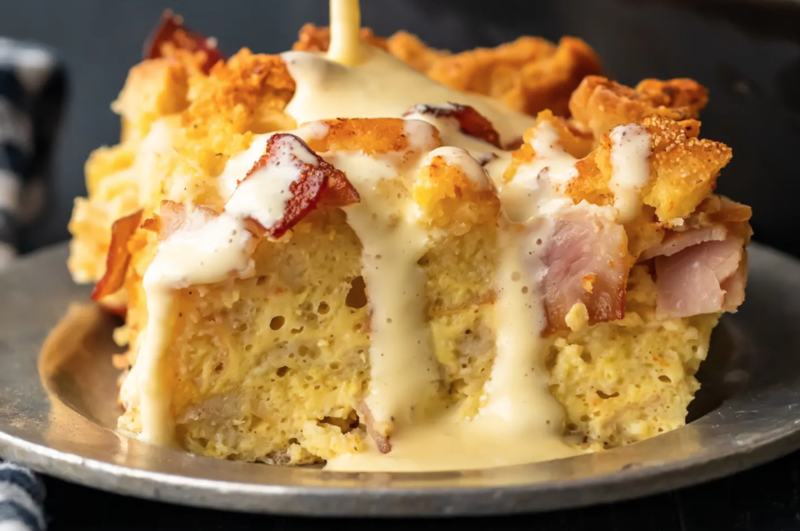 I am all about this recipe for an Eggs Benedict Casserole. Who’ll come over and be my taste-tester? I would also like to try this carrot cake recipe. Did you catch this thread that went viral on Twitter? I’m SO OBSESSED. This gal is doing the lord’s work, IMO. A client of mine, Casey McQuillen, premiered her new music video on EXTRA! She’s so wonderful and so talented. Please take a look. Another client I am working with, Nick Howard, was on a local morning show here in Los Angeles and he is a GORGEOUS singer. And the anchor’s reaction to his performance is pretty great. I just attended the Digital Summit in LA. For the snark on that, check out my personal Instagram where there’s a Story pinned to my profile. I reviewed my new Jord watch and launched a related giveaway! Social Media Club LA has an awesome podcast panel coming up on April 23! Join us. Speaking of podcasting, expert Kelly Glover, gave a great interview on the space and how to convert listeners to MONEY. Unless you live underground, you probably heard about Disney’s new streaming platform. Frankly, this looks awesome and I am excited as all get-out for it. I find the Queer Eye “Fab 5” so god damned delightful.